Western Carolina Catamount Sports............All Catamount Sports............All the time. It's now 91 days until kickoff of Catamount football at the Raymond James Stadium, home of the University of South Florida Bullson August 30th in in Tampa, FL. To help pass those long summer days until football season starts, and hopefully get the Catamount faithful more excited about the upcoming season, we'll continue the 100 day football countdown each day until kickoff day. 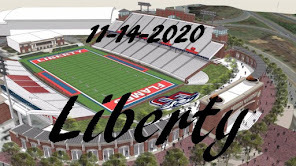 Since no player is currently assigned #91, continue with the defensive line, and highlight one of our incoming freshmen. Prior to Western Carolina: Played along both the offensive and defensive line ... Named to the High School Sports Report (HSSR)-South Carolina Independent School Association (SCISA) Class AAA All-State team ... Credited with 61 total tackles as a senior including 22 solo stops and 8.5 tackles for loss and seven sacks ... High school coach was Rick Reetz. Personal: Is the son of Sarah Marshall. Note: Chose Western Carolina over Furman and Richmond. It's now 92 days until kickoff of Catamount football at the Raymond James Stadium, home of the University of South Florida Bullson August 30th in in Tampa, FL. Today we'll continue to highlight the defensive line. Prior to Western Carolina: A four-year varsity letter winner, helped North Davidson High and head coach Mark Holcomb to the 4-A state playoffs all four seasons including a 14-1, Western Region runner-up finish as a senior ... Finished his prep career with 292 tackles and 47.5 career sacks including leading the state of North Carolina with 23.5 sacks as a senior ... Had a career-high 103 tackles and forced three fumbles in his final season at NDHS ... Was a two-time All-Central Piedmont Conference selection, earning both the CPC's and Davidson County's Defensive Player of the Year plaudits as a senior ... Also a two-time All-Northwest pick by the Winston-Salem Journal ... Tabbed All-State by NCPreps ... Moving up to the varsity squad as a freshman, recorded a quarterback sack and forced a fumble in his first game to earn his roster spot ... Listed as a two-star prospect by Rivals.com. It's now 93 days until kickoff of Catamount football at the Raymond James Stadium, home of the University of South Florida Bullson August 30th in in Tampa, FL. 2012 (Freshman): Started the first five games of his collegiate career before coming in as a reserve along the defensive line the final five games, playing in 10 of the 11 seasonal games ... Recorded 22 tackles including 14 solo stops including 2.5 sacks and 1.5 tackles for loss ... Tallied a career-high six tackles - all solo hits - at nationally-ranked Wofford ... Credited with two quarterback hurries and recovered a fumble forced by classmate Sertonuse Harris in the end zone for a touchdown against Samford. Prior to Western Carolina: Named the Defensive Lineman of the Year in the PAC-6 Conference as a senior... Was additionally named to the All-PAC 6 post-season honorary squad at defensive end ... Also played basketball as a prep. Personal: Full name is Caleb Xavier Akinseye Hawkins ... Is the son of William Peebles and Moya Hawkins. It's now 94 days until kickoff of Catamount football at the Raymond James Stadium, home of the University of South Florida Bullson August 30th in in Tampa, FL. 2012 (Freshman): Saw action in all 11 games with five appearances among the starting lineup ... Finished with 22 total tackles including 12 solo stops and 3.5 tackles for 12 yards in losses ... Also recorded 1.5 quarterback sacks ... Both forced and recovered a fumble, pouncing on a loose football in the opener against Mars Hill and jarring the ball loose at nationally-ranked Wofford ... Tallied a career-high eight tackles including three solo stops against Appalachian State ... Credited with a pass break-up, swatting a pass at the line of scrimmage ... Forced the game's only turnover in WCU's annual Spring Game, knocking the football loose downfield after an inside completed pass. Prior to Western Carolina: Helped guide Northern Guilford to a both a Mid-State 3-A Conference championship and North Carolina 3-AA state championship as a senior, boasting a 14-1 record ... Northern Guilford won the title game, 31-6, over Crest HS ... Finished with 99 total hits including 71 solo stops and 12 sacks ... Also broke up two passes, forced and recovered three fumbles for 25 yards of return while blocking three kicks including two field goals and a punt ... Named All-Mid-State 3-A Conference as well as to the first team All-Area defense by the Greensboro News & Record ... Also played basketball as a prep where he was selected to participate in the Carolina Challenge. Personal: Full name is John Christopher McBeth ... Is the son of Lynette McBeth. It's now 95 days until kickoff of Catamount football at the Raymond James Stadium, home of the University of South Florida Bulls on August 30th in in Tampa, FL. Prior to Western Carolina: Earned All-Tri-Nine Conference accolades as a senior, garnering first team defense honors ... Selected as the Holly Springs High Defensive Player of the Year ... Played as a defensive lineman and linebacker as a prep ... Was named the overall MVP as a junior at the National Underclassmen combine held in Greensboro. Personal: Full name is Daniel Lawrence Nash ... Is the son of Evelyn Worthy and step-father, Patrick Worthy ... Was born in Poughkeepsie, N.Y. ... Has an older brother, Michael Bayon Jr ... Is a member of the media ministry at his church, Wake Chapel, where he operates the boom camera during Sunday services. It's now 96 days until kickoff of Catamount football at the Raymond James Stadium, home of the University of South Florida Bulls on August 30th in in Tampa, FL. Prior to Western Carolina: Two-time All-I-Meck Conference selection who was a conference player of the year finalist as a senior ... Played both ways as a defensive end and a tight end on offense ... Also played power forward on the basketball court as a prep earning all-conference accolades. It's now 97 days until kickoff of Catamount football at the Raymond James Stadium, home of the University of South Florida Bulls on August 30th in in Tampa, FL. Since no player is currently assigned #97, we'll highlight one of our incoming freshmen. Prior to Western Carolina: Was a four-year starter on both the offensive and defensive line ... Earned first team all-region offensive line for 8-AAAAA in Georgia as a senior ... Finished his senior season with 44.5 tackles including 6.5 tackles for loss and 1.5 sacks ... High school coach was David Wagner. Personal: Is the son of Joseph and Melinda Junius ... Has a brother, Joey, whom with he played high school football. Note: Chose Western Carolina over Georgia State, Presbyterian and Point University. It's now 98 days until kickoff of Catamount football at the Raymond James Stadium, home of the University of South Florida Bulls on August 30th in in Tampa, FL. Since no player is currently assigned #98, we'll highlight one of our incoming freshmen. Prior to Western Carolina: Was a two-time All-Carolina 10 2A/1A Conference lineman ... In 2012, was named All-Area as an offensive lineman ... Also played basketball as a prep ... High school coach was Jason Tudryn. Personal: Is the son of Beverly Thompson. Note: Chose Western Carolina over North Carolina A&T. Per FootballScoop.com, Jaybo Shaw, an offensive quality control coach at Army, is the new receivers coach at Western Carolina. Former Georgia Southern quarterback and assistant Jaybo Shaw has joined the WCU staff as wide receivers coach. Shaw was a two-year (2010-2011) starting quarterback at Georgia Southern for new Army football coach Jeff Monken. He helped Georgia Southern to a 21-8 record and led Eagles to FCS semifinals in both seasons. Shaw played his freshman and sophomore seasons at Georgia Tech for Paul Johnson. Shaw helped coach Georgia Southern running backs and quarterbacks as a graduate assistant in 2013. It's now 99 days until kickoff of Catamount football at the Raymond James Stadium, home of the University of South Florida Bulls on August 30th in in Tampa, FL. Since no player is currently assigned #99, we'll highlight one of our incoming freshmen. Prior to Western Carolina: A three-year varsity letter winner ... Was a two-time All-Mid-Piedmont 3-A Conference along the defensive line and three-time all-county ... Finished his senior season with 87 tackles including 37 solo stops and two sacks, often drawing double-team blocks ... Recorded 244 career tackles including 21 career sacks and forced five fumbles ... Holds the CDHS all-time tackles for loss record ... Won the Defensive Line MVP award at the National Underclassmen (NUC) five star camp held in Myrtle Beach, S.C., in March of 2013 ... Also participated in track & field as a prep, earning all-county, and all-state honors as a junior ... High school coach was Chad Tedder. Personal: Is the son of Derrick Sr., and Bobbie Jo Davis. Note: Chose Western Carolina over Davidson, Harvard, North Carolina A&T, and a walk-on offer at North Carolina. The fourth-seeded Georgia Southern Eagles eliminated No. 1 seed Western Carolina 8-4, in Thursday's first game of the Southern Conference Baseball Championship at Joseph P. Riley, Jr. Park. With the Catamounts leading 2-1, the Eagles hit back-to-back home runs in the sixth inning to claim the lead. The Cats answered with an Adam Martin homer to lead off the bottom half of the sixth, tying the game at 3. In the top of the 7th, the Eagles drew a one-out walk, then Dalton Busby hit a homer the left field fence to up the score to 5-3 in GSU's favor and going ahead for good. Jeremy Null took the loss, allowing five runs on seven hits and two walks in 6 1/3 innings, and striking out five. Welcome to the fifth annual Catamount Sports Forum's "100 days to Football Kickoff Countdown". We hope you enjoy the countdown as much as we do bringing it to you. During the countdown, we'll highlight that player's number the corresponds with that day's number. Since the 2014 roster has not yet been posted, we'll use the 2013 Roster until the new roster is posted on the athletic site. Since there is no player with the #100, here's the traditional head coaches posting. Mark Speir, who has spent much of his 21-year coaching career at the NCAA Football Championship Subdivision (FCS) level, was named head football coach at Western Carolina University as announced by Director of Athletics Randy Eaton during a press conference held in the Ramsey Center on Dec. 22, 2011..
Speir (pronounced "spear"), who got his coaching career start at Western Carolina under former Catamount head coach Steve Hodgin from 1991-96, becomes the 13th head coach of the WCU football program all-time..
"When I stood at my introductory press conference last week, I told the Catamount nation that I was looking for four main attributes of our next head football coach: a love for the student-athlete and an unwavering commitment to their success, both on and off the field; a track record of success at the FCS level; pre-existing relationships with local and regional high school coaches; and someone who is a `fit' in the athletics department, on campus and in the community. I have found all four in Mark Speir," said Eaton..
Speir returns to Cullowhee after spending the past nine seasons at Appalachian State where he was a part of three-consecutive FCS National Championships from 2005-07, serving as the program's recruiting coordinator since 2004 while also most recently coaching the inside linebackers. He has also coached the Mountaineers' running backs (2003-04), defensive line (2005-08) and defensive ends (2009-10).. In 2009, Speir was tabbed as the NCAA Division I FCS Assistant Coach of the Year by the American Football Coaches Association (AFCA). 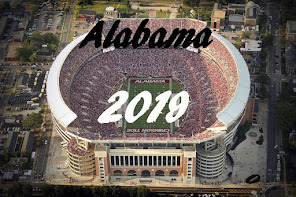 The award has been handed out every year since 1997 at the five levels of football including the NCAA Football Bowl Subdivision (FBS), FCS, Division II and III, as well as NAIA levels.. Prior to Appalachian, Speir also made coaching stops at both at Presbyterian (1997-99) while the Blue Hose were a NCAA Division II member institution, and at Elon (2000-02) the year after the program made the transition to a NCAA Division I school..
A native of Kannapolis, N.C., Speir broke into coaching while an undergraduate at Clemson University, working as a student assistant from 1986 through 1989, helping the Tigers to three Atlantic Coast Conference (ACC) Championships during his four years. Following his graduation with a bachelor's degree in secondary education in 1990, Speir landed on Hodgin's staff in Cullowhee, first working with the running backs from 1991-93, then the linebackers in 1994 before coaching the defensive line and serving as the program's recruiting coordinator from 1995-96.. Throughout his collegiate coaching career, Speir has made a name for himself through the recruiting process. He has held the title of recruiting coordinator at three NCAA FCS institutions (WCU, Elon and ASU), most recently organizing the efforts that landed Appalachian State six-consecutive crops of freshmen that have been widely considered to be among the top in NCAA Division I FCS recruiting classes and that helped the Mountaineers to three-straight national titles..
On the field, Speir has coached multiple All-Southern Conference selections in five of the past six seasons. In all, he has coached nine all-conference honorees that have earned the distinction 13 times in his nine seasons on staff..
Six of Speir's position players have garnered All-America honors during his tenure at ASU including the most recent recipient, linebacker Jeremy Kimbrough, who was selected to the second team by The Sports Network. Additionally, defensive ends Jabari Fletcher, Jason Hunter, Marques Murrell and Gary Tharrington and defensive tackle Anthony Williams combined for All-America honors a total of six times..
Speir's most notable pupils, Hunter and Murrell, tied for the SoCon lead with 13 sacks apiece and accounted for six defensive touchdowns between them in 2005. Murrell also led the nation with 13 sacks in `06. Both have enjoyed productive NFL careers, with Hunter entering his sixth pro season this year with the Denver Broncos..
Off the field, Speir is involved in many charitable causes. He has raised more than $30,000 to help rebuild the Memorial Christian Hospital in Bangladesh by training for and participating in the 2008 Music City Marathon in Nashville, which he finished in 4:01; the 2009 Boston Marathon, which he completed in 3:59; and the 2010 Flying Pig Marathon in Cincinnati. In 2009, he traveled to Bangladesh to provide much-needed medical supplies and volunteer at the hospital for 10 days.. In 2011, Speir turned to organizing and participating in motorcycle tours as a way to continue to raise funds for the worthy cause..
Speir is married to the former Paige Holt of Pickens, S.C., and the couple has two sons -- Zeb and Jackson..
Two victims of upsets Wednesday morning, will meet in Charleston on Thursday's first elimination game of the day in the Southern Conference Baseball Tournament. Two of the SoCon's best overall teams will meet, and one will go home after playing only two games in the tournament. It's a variation of the old one-and-done, but here, it's "2 and done". Fourth seed Georgia Southern was defeated by Appalachian State in the first game of the day Wednesday morning in extra innings, losing by a final score of 3-2. In the second game of the day, number one seed Western Carolina faced number 8 seed Furman, and promptly lost to the Paladins in what is the major upset of the tournament. The Eagles come to the game at 34-21, while the Cats are 37-17 on the season. The Cats and Eagles played three. one run games in early May, with Georgia Southern taking two of the three. It would seem that fate has the Cats playing back to back the only two teams that won weekend series over Western Carolina. Furman's Matt Solter pitched seven solid innings, on the way to Furman's 3-2 victory over top seed Western Carolina in tournament action Wednesday afternoon at Joseph P. Riley Park. Furman's win over Western Carolina was their third win in four meetings this year. The Paladins took two of three from the Cats in Cullowhee during the regular season. Including today, Furman pitching has surrendered just three runs to Western Carolina in the last 20 innings of play between the two teams. "Matt Solter was just outstanding today on three days rest. He really competed very well," said Furman head coach Ron Smith, "We played clean defense and were able to scratch an early run across. The runs we got in the seventh inning were huge. We had a couple of early opportunities with runners on second base and less than two outs but couldn't get them in, which I was afraid was going to come back and haunt us. Other than that our pitching was outstanding. Billy Greenfield did an outstanding job, and I loved seeing Brant Masters come in and do a great job for us closing it out. This was a huge win for us." Furman took advantage of two Catamount errors in the first inning to take a 1-0 lead. Then the Paladins padded their lead with two runs in the seventh. Jordan Smith was charged with the loss after allowing three runs, two of which were earned, on nine hits over 6 1/3 innings. He walked two, struck out a pair, and was charged with two of the Catamounts' four errors. Overall, the Cats committed four errors. "We didn't play very well and you have to give a lot of credit to the pitcher from Furman (Matt Solter); he was outstanding. We made four errors and our pitcher made two errors in the first inning. He is one of the best fielders I've ever seen in 28 years of coaching. I've never seen that from him, throwing a pick away. You have to give Furman credit in the seventh for tacking on two more. We've got to play better tomorrow." said head coach Bobby Moranda. Western Carolina now moves to the loser's bracket and will face fourth-seeded Georgia Southern at 10:00 AM in an elimination game. GSU is the only other team besides Furman that won a series from the Catamounts during the regular season. RHP Jeremy Null is scheduled to start, and GSU will start LHP Sam Howard. "We are facing an outstanding pitcher tomorrow in (Sam) Howard." added Moranda, "He is outstanding and they have a great team. It is going to be a dog fight. We will come to the park ready to go. 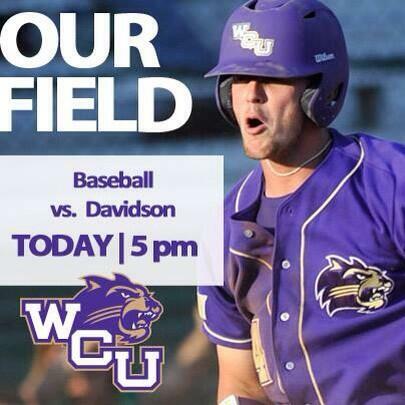 We have to play a better brand of Catamount baseball tomorrow." The Paladins beat UNCG by a final score of 6-5 in 11 innings Tuesday, in their play-in game in the Southern Conference Baseball Tournament and will face the number 1 seed Catamounts on Wednesday. Both the Spartans and Paladins had 15 hits in the game, but the determining factor was the four errors committed by the Spartans, with two of those four errors coming in the bottom of the 11th inning. Furman enters Wednesday's game against the Catamounts with a 24-31 overall record and are 11-15 in the SoCon. In road games this season, the Paladins are 11-13 and they are 3-2 in games on neutral fields. Furman is 6-4 in their last 10 games. If you'll recall, the Paladins took two games from the Cats in Cullowhee back in early March, winning games 2 & 3 of the series. Bradley Strong put up four hits and drove in two runs as the Cats rode the eight strikeout performance by starter Jeremy Null, as the Cats won game one, 5-4. In game #2, Furman scored three unearned runs with two outs in the top of the ninth inning as the Cats dropped game two, 9-6. In game three, a strong eight-inning pitching effort by Furman's Tyler Wood limited the offensive effort by the Catamounts, as Furman won the rubber match by a final score of 6-1. This could be a dangerous game for the Cats, with the Paladins coming into Wednesday's game with lots of confidence. First team All-Southern Conference selection, right-hander Jordan Smith (8-4) will be the starting for the Catamounts on Wednesday. Smith is WCU's all-time leader in games started (58) and innings pitched (368.1), Smith also led the SoCon with 98.2 innings pitched during the regular season. After being named to first team All-Southern Conference by both the coaches and media polls, Catamounts Adam Martin and Jacob Hoyle have been named Co-Players of the Year for the Southern Conference by College Baseball Daily. "Catamount senior Adam Martin swept the top spot in both tabulations at the catcher position. The slugger paced the SoCon with 64 RBI on the year to rank sixth nationally, recording a team-best 17 multiple RBI games. He batted a career-best .303 during the regular season with 59 hits including 24 for extra bases, adding a career-high seven stolen bases. Martin hit 13 home runs - eight coming in conference play and two as grand slams - with 10 doubles and a triple. Martin held an 11-game hitting streak this season and ranked third on the squad with an 18-game reached base safely streak. His name appeared on the Johnny Bench Award Watch List - an honor that goes to the nation's top catcher - for a second-consecutive season. He earned his second SoCon Player of the Week accolade in mid-March en route to garnering the league's top monthly award, batting an impressive .415 in 17 games with 35 RBI, eight home runs, five doubles and a triple in March alone. The regular-season SoCon home run leader, Jacob Hoyle rounded out WCU's trio of first team selections from both post-season voting. A native of Hickory, N.C., Hoyle finished the regular season tied for the team-lead in batting average at .332, collecting 72 base hits including 25 for extra bases. He hit a team-best .379 in conference games alone with seven homers and eight doubles for a .660 slugging percentage. He was second on the team with 52 RBI to rank tied for second in the conference behind Martin. Hoyle, who put together WCU's longest consecutive game hitting streak this season at 15-straight, leads the team with 25 multiple hit games and is third with 14 multi-RBI outings this season. Named SoCon Player of the Week on May 5, Hoyle was also named Capital One Academic All-District 3 - the fourth different Catamount baseball player to receive the recognition all-time - and is eligible for Academic All-America honors." Purple & Gold congratulates the Southern Conference All-Conference selections for 2014. Riley Park ticket window opens one hour before first pitch. Game 1: #8 Furman vs. #9 UNCG 12 p.m.
Game 2: #7 Elon vs. #10 The Citadel 3:30 p.m.
Game 3: #4 Georgia Southern vs. #5 Appalachian State 10 a.m.
Game 4: Winner Game 1 vs. #1 Western Carolina 1 p.m.
Game 5: Winner of Game 2 vs. #2 Davidson 5 p.m.
Game 6: #3 Samford vs. #6 Wofford 8 p.m.
Game 7: Loser Game 3 vs. Loser Game 4 10 a.m.
Game 8: Loser Game 5 vs. Loser Game 6 1 p.m.
Game 9: Winner Game 3 vs. Winner Game 4 5/8 p.m.
Game 10: Winner Game 5 vs. Winner Game 6 5/8 p.m.
“That was amazing! Winning it on the last day (of the season), dogpile on your home field, you couldn’t ask for anything more,” said senior outfielder Cody Jones, the former Enka High standout who helped his team stretch its home record to 22-3 this season. 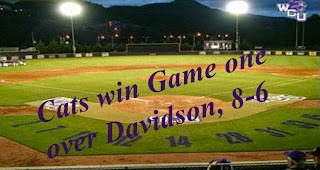 Adam Martin's grand slam in the seventh inning ignited a Western Carolina comeback, as the Catamounts rallied to defeat league leading Davidson, 8-6 in game one of the three game series that turns out to be for the regular season So Con Championship. With the win, the Catamounts improved to 35-16 and reclaims first place in the Southern Conference with a 18-6 league record. The Wildcats drop to 28-15 overall and 17-6 in league play. 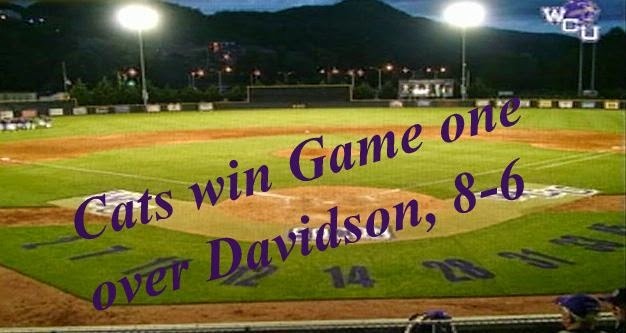 By winning the first game of the series, the Catamounts now need to win one more game of the two remaining, to claim the regular season championship for the second straight year. Davidson will need to win both ends of the doubleheader between the two teams scheduled for Friday, to win the title. Davidson led 6-1 going into the bottom of the seventh inning, with Martin's grand slam putting the Cats within one run of Davidson. The Cats scored three in the eighth, with a two-RBI double by Jacob Hoyle driving in the winning runs. The Wildcats pounded out 16 hits to Western's nine, with the Wildcats stranding 13 base runners. Closer Tyler Powell earned his 12th save of the season, placing him third in the WCU single-season record books. WCU head coach Bobby Moranda earned his 230th career victory, moving past former Catamount skipper Keith LeClair (229-135-2 in six seasons). Moranda picked up the win while serving a one-game suspension from being tossed last Sunday at Georgia Southern. Western Carolina has offered Austin Cooke. WCU seems to be Cooke's first offer. "It's wrong not to have that memorial finished,"
(c) 2017. Awesome Inc. theme. Powered by Blogger.